Before Samhain - or Halloween - for the past few years I've been posting a series of photos of London's burial grounds under the title London Necropolis - a Necropolis being a city of the dead. I've also been visiting London's "Magnificent Seven" Victorian cemeteries. I've visited six of them so far: Nunhead, Highgate, Brompton, West Norwood, Abney Parkand Kensal Green Cemetery. I took this photo at Highgate on my visit there a few years back. I love the statue of a sleeping lion on this tomb - it makes me think of Aslan in The Lion, the Witch and the Wardrobe. However, the story behind this tomb left me with such mixed feelings that I haven't blogged about it before. Now I've decided to take the plunge - see what you think about the tale of 19th century menagerie keeper George Wombwell and his tame lion Nero. George Wombwell was a Soho shoemaker, but turned to a career of exhibiting animals after buying two boas in London's docks from a ship from South America. He exhibited them in taverns across the city and made such a good profit that he began to buy other exotic animals from ships that came from Africa, Australia and South America. His favourite was a lion who he called Nero and who was particularly friendly. In 1810 he founded the Wombwell's Travelling Menagerie and began to tour fairs. Of course, some of the animals died because they were not given the correct treatment. At the time, I am sure no one considered this cruel in the way it would be thought of today. Even more shocking to modern ears, Wombwell, in collaboration with Sam Wedgbury and dog dealer Ben White's assistant Bill George, arranged lion-baiting between the docile lion Nero and six bulldogs. Nero refused to fight, although a second lion released into the ring quickly mauled the dogs. However, Wombwell also gained a reputation for treating sick animals. On one occasion Prince Albert summoned him to look at his dogs because several had died. Wombwell noticed that there was something wrong with their water, which was poisoning them. When the prince asked what he could do in return for the favour, Wombwell asked for some oak timber from the recently salvaged Royal George ship. From this he had a coffin built for himself, which he then exhibited along with his animals. 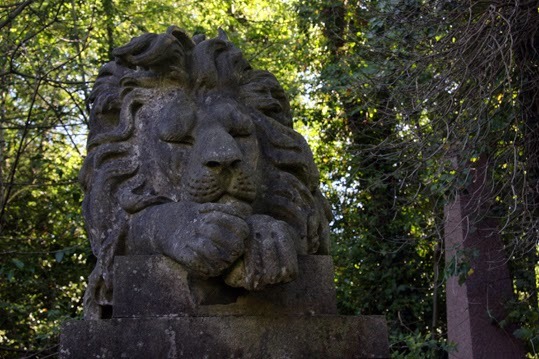 George Wombwell died in 1850 and was buried in his Royal George coffin in Highgate Cemetery, under a statue of his favourite lion Nero.